Streamlined Backshop offers decoder installation services to my customers because they do not have the time, the interest or the ability. Please note this advisory is not inclusive of all Roundhouse 2-6-0 Moguls and could be simply a manufacturing error on this single unit. The incident should not incite internet hysteria or lead to a mass recall of the model. The story is a good lesson though and a reminder that even easy ain't always easy. Every now and then I get job I like to call the "gravy". It's one of those opportunities that are supposed to be quick and easy and I can knock it out at the end of long day then sleep easy on the effort. A little gravy for my biscuits, if you will. The Roundhouse 2-6-0 has been produced in many forms over the years. I recently worked on one as DCC with Sound installation project for a customer that too my surprise was "DCC-Ready". I opened the tender shell and found a traditional 8-pin NMRA plug mounted to a small carrier circuit board. His decoder would not fit but I had one on the shelf that would. So I remove the 8-pin jumper plug from the carrier board, plug in my new decoder that was pre-programmed, tested and ready to go, place the model on the track with great anticipation of tasting that gravy. I like to use the cab-driver feature of my ESU LokProgrammer to test all of my installations, no matter what scale, brand of decoder, or type of loco, before doing anything else because I have found the LP provides superior short circuit detection and usually protects the decoder from damage whenever there is an issue. I put the little loco on the track and the LP shut down instantly. Fiddle for a bit, same thing. Test decoder, ok. Test loco on DC with jumper plug, ok. Fiddle a bit more, same thing. So I take the loco back to the bench and start an in-depth investigation to troubleshoot the issue. Biscuits are barely warm now, gravy has a skin over the top of it. Using my trusty multi-meter to check continuity, I start probing the wire connections of the loco. I remove the plug and check for continuity across the drivers. None. Good. I start probing point to point from the 8-pin plug on the carrier board to the respective termination. I start with pin 4 (left driver) since it is closest to me and the loco is laying so that the left drivers are easiest to access and work my way back to pin 1. From pin 1 (motor +) to right driver I have continuity. Huh? Check a couple more times. Sure enough. Dead short. Remove the cab and boiler to test the motor and sure enough, continuity from pin 8 (right driver) to motor +. Turns out, the unit is wired wrong from the factory. The unit ran fine on DC because the jumper plug connects pin 1 and pin 8, motor + to right rail to complete the DC circuit. The unit failed on DCC because the decoder connects pin 1 to the right rail instead of motor + causing a short in the decoder motor circuit. Rule #1 for DCC Installs - Isolate the motor + and - from right and left rail. 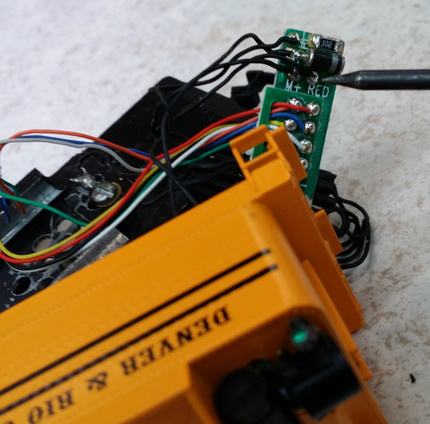 Said another way... Never, ever let motor + or motor - contact the right or left rail when installing a DCC decoder. Fortunately the LP protected the decoder. I swapped the wires on the carrier board where it is labeled M+ and RED, reassembled the works, re-installed the decoder, then re-tested. Success. Biscuits stale, gravy is cold. Guess I'll call it a day. Be sure to visit my online store today for a fantastic selection of DCC and scale model trains.